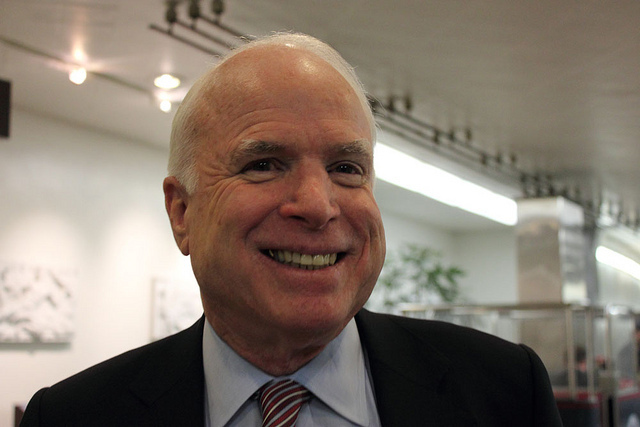 John Sidney McCain III was born August 29, 1936. McCain wished to emulate his father and grandfather who were both four-star admirals by joining the United States Navy. He graduated from the U.S. Naval Academy in 1958. He then became a naval aviator which among other things involved flying ground-attack aircraft from aircraft carriers. He almost lost his life in the 1967 USS Forrestal fire duiring the Vietnam war. While on a bombing mission over Hanoi in October 1967 his plane was shot down. He was badly injured as a result of the attack and captured by the North Vietnamese. He remained a prisoner of war until 1973. He was tortured and was also refused an out-of-sequence early repatriation offer. Subsequently he was left with lifelong physical limitations because of his years as a prisoner of war.